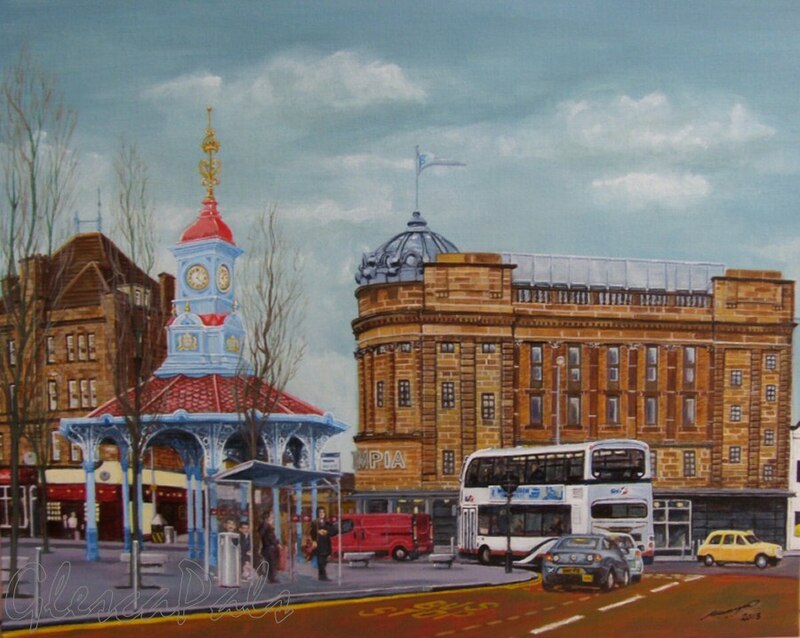 Painting by 'glesca artist' (Wm.Neilly) shows the Umbrella and the Olympia building following their complete restoration under the Clyde Gateway Urban Regeneration Project. The famous and historic landmark, Grade A listed, Bridgeton Cross Umbrella, was restored to its full glory in 2011 with a substantial contribution from the Glasgow City Heritage Trust. The imposing, Grade B listed, Olympia building on the gushet between Orr Street and Olympia Street and facing Bridgeton Cross was completely revamped and returned to public use in 2012. The four-storey, Grade B listed, tenement at the junction of Orr Street and London Road flanks the former Bridgeton Central Railway Station. Painted using acrylics on canvas board measuring 508 x 406 mm (20” x 16”) in March 2013.